Category Archives: Charles W. Brown Jr.
Charles W. Brown Jr., the son of Eva Nellie and Charles Ward Brown lived a good life in Winnipeg. Unfortunately I do not know much about Charles Jr. other than he might have married a lady by the name of Victoria and if he had children I do not have that information. He does appear in the 1916 census along with his parents and he was still in Winnipeg at the death of his father Charles W. Brown in 1935. Winnipeg city directories state that he worked for the Teller Hurton & Erie Mortgage Co. and lived at 134 Walnut probably inheriting the house after his father’s death. By 1940 to 1948 he apparently worked as a clerk for the Huron & Erie Mortgage Co. and lived at 19-558 Sherbrooke St., later 3 -217 Sherbrooke. In 1945 he is also listed as working for the Canada Trust at 23-513 Sherbrooke St.
By 1947 he is an employee at the Modern Laundry and is living at 945 Wallasey St.
From 1950 to 1952 he is assistant engineer at the Manitoba Telephone Co. and now he is living at 1526 Logan Ave. In paranthesis the name (Donna) appears that usually refers to the wife’s name. So this might be him. It suggests he may have remarried? I do not know when Charles Jr. passed he could have lived in Winnipeg well into the 1980’s maybe even into the 1990’s. The privacy laws of Canada are strict and so until I get an opportunity to visit Winnipeg I will not be able to learn more about Charles Jr. or his siblings Marjorie or Alvin. The photographs I inherited of the family have many that are not identified, so I may have a photograph of Charles but not realize it. At some point I will share those unidentified photographs. This entry was posted in Alvin Leslie Ward Brown, BROWN Surname, Canada, Charles W. Brown Jr., Charles Ward Brown, Manitoba, Marjorie Brown, Richard and Emma (Ward) Brown, Winnipeg and tagged Charles W. Brown, Eva Nellie Brown, Winnipeg on July 22, 2011 by BJ MacDonald. Charles Ward Brown Passes in 1935! Charles worked in the insurance industry for many years and may have even owned his own agencies because they had the “Brown” name in the title, for a long period of time. More research on my great-uncle needs to be done. He died on 21 July 1935 in Winnipeg and his wife Eva Nellie survived him by many years living to 89 years old. Eva Nellie died on the 19th of April 1970 in Essondale, British Columbia (per my cousin R. Hayes). A city directory listing has her in Winnipeg in 1936 living at the 134 Walnut street address. In 1939 to 1951 she is listed as the widow of Charles W. or under Mrs. Eva N.
Charles is buried in the St. John’s Cemetery in Winnipeg although a stone or engraving was not done for Charles that I can see from the photos. Brown – On July 21, at the Winnipeg General Hospital, Charles Ward Brown, 134 Walnut St., aged 60 years.  Funeral service at 2 p.m. Wednesday at the A.B. Gardiner Funeral home, 178 Kennedy St. Internment in the family plot in St. John’s cemetery. 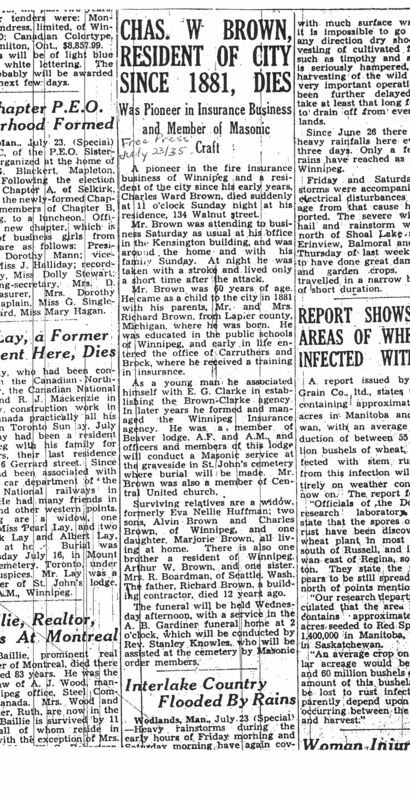 Winnipeg Free Press, Tuesday July 23, 1935. 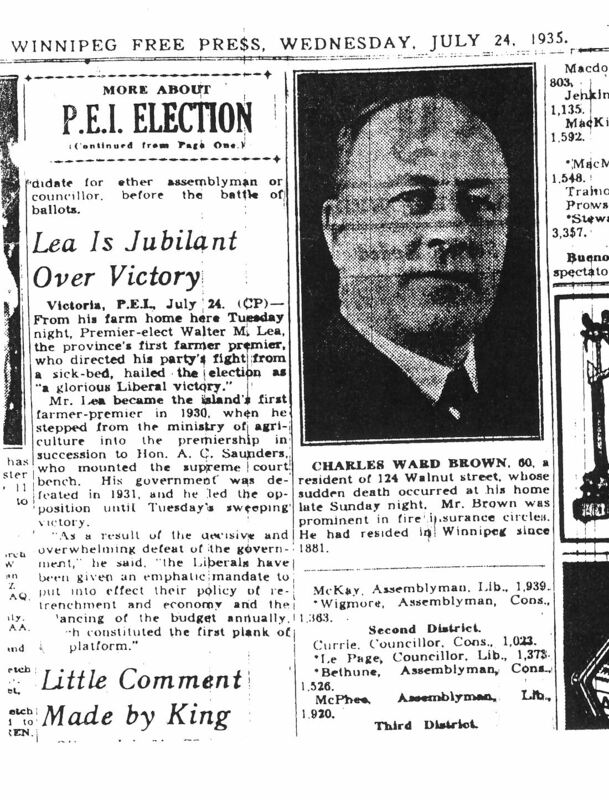 The Winnipeg Free Press also ran a photo on July 24, 1935 and on another page on July 23, 1935 they gave a very details obituary notice for Charles. The obituary photo and notice were provided to me by my cousin Robert Hayes. Hint: Click on the photos and documents and they should appear in a larger screen. Remember to click the back button to return to this blog. This entry was posted in Alvin Leslie Ward Brown, Arthur Ward Brown, BROWN Surname, CEMETERIES, Charles W. Brown Jr., Charles Ward Brown, Eva Nellie Haffman, Lapeer County, Marjorie Brown, Michigan, Richard and Emma (Ward) Brown, Robert and Ethel Boardman, St. John's Cemetery, WARD Surname, Winnipeg and tagged Charles W. Brown, Eva Nellie, Haffman, Huffman on July 10, 2011 by BJ MacDonald. Charles W. Brown Remarries 1909! Several years later after the death of his first wife, Charles remarried to Eva Nellie Haffman (Huffman) on 14 October 1909 in Winnipeg (Manitoba Vital Records). 1. Alvin Leslie Ward Brown born about 1910. Alvin appears in the 1916 census and is found residing in 1935 in Winnipeg at his father’s death. 2. Charles W. Brown Jr. born about 1913. He marries to a Victoria ______. 3. Marjorie Brown no information. Charles and Nellie appear in the 1911 and 1916 Canadian Census as they build their life and family together. Line 21, 294, Brown Charles Ward, male, head, married, Jan 1875, 36. Line 22, 294, Brown Eva Nellie, f, wife, married, Apr 1882, 29. Line 23, 294, Brown Elvin Leslie Ward, male, son, single. Oct. 1910, 7 mos?. 24, 294, Smith Louisa, f, domestic, single, June 1893, 18. Charles continues to work for the Brown – Clarke Agency from 1906 to 1926 per the city directories of Winnipeg. He also moved from 153 Magnus Ave. to 134 Walnut St. Source: Charles W. Brown Family, 1916 Canadian Census, Winnipeg, Manitoba, Canada pg. 45, 15 Winnipeg S, ED 7. Line 33, 402, 514/ Brown Charles W., #134 Walnut, Head, M, Married, age 38 born Ontario, Manager Insurance, Brown Eva, wife, female, married age 33, born Manitoba, Brown Alvin, son, [nw] single, age 5 born Manitoba, Brown Charles, [nw] single, age 4 born Manitoba, Lundslen, Charlotte, servant, female, single age 28 born Manitoba, servant private, All Cong’l, Servant is Presby., Charles lists himself as Scotch. All speak and write English except for the 4-year-old. According to the city directories of Winnipeg Charles started working for the Jamieson & Brown Ltd. company in about 1926 and continued their till 1930. By 1935 he was the Manager at the Winnipeg Insurance Agency and he was still living at 134 Walnut Street. This entry was posted in Alvin Leslie Ward Brown, BROWN Surname, Charles W. Brown Jr., Charles Ward Brown, Eva Nellie Haffman, Marjorie Brown and tagged Charles W. Brown, Eva Nellie Haffman on June 25, 2011 by BJ MacDonald.